If anyone has any info that may be helpful ? 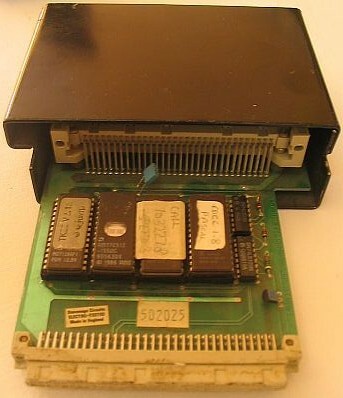 The QL Wiki provides an image of the CST RAM Expander, showing those 4 ROMs fitted and both a 14-pin and a 16-pin IC alongside. The image (see here: https://qlwiki.qlforum.co.uk/lib/exe/fe ... amplus.jpg) is too blurry to make-out the full chip-markings for the 16-pin device, but it appears to be an SN74LSxxx - and, as there are not so many 16-pin ICs in the 74 series, I'm guessing its a 3-8 line decoder/multiplexer (e.g. the 74138). EDIT: The manual also available from the QL Wiki actually includes a full chip layout diagram - very unusual! The chip in question appears to be the LS139 - "dual 2 to 4-line decoder/demultiplexer, inverting outputs"
Thanks Martyn - I couldn't see that for looking last night !! A decoder would have been my guess too.